Governor Underlines Need for Campaign Finance Reform: Oregon Gov. 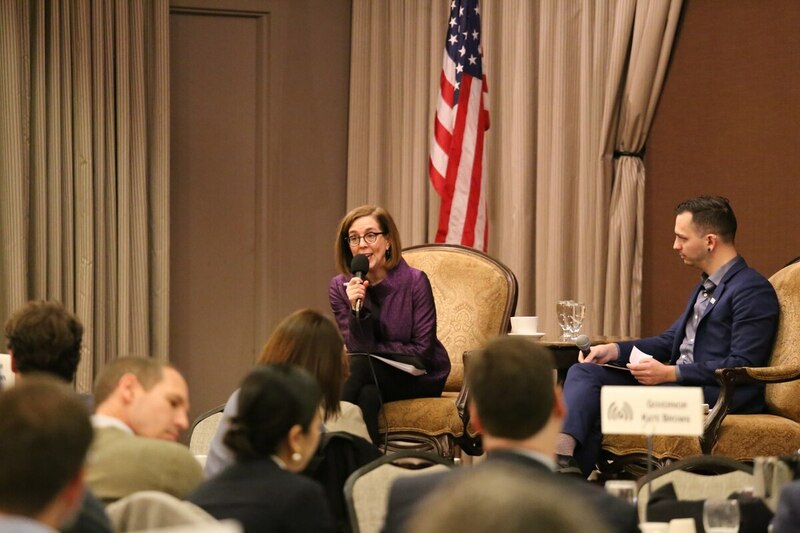 Kate Brown has pledged to address the state's lack of campaign contribution limits—a system she called "mind-boggling" in recent legislative testimony. That didn't stop Brown from accepting $10,000 from Intel on March 14, right in the middle of high-stakes negotiations over cap-and-trade legislation and new corporate taxes—both of which threaten steep costs for the tech giant. Most lawmakers don't accept contributions during the session—in fact, House rules forbid it. Intel has made only two previous contributions to Brown: $5,000 in 2017 and $14,700 last October. Intel spokeswoman Linda Qian says the company decided in January to donate to Brown's inaugural gala, but processing the check took time. Brown's campaign spokesman, Thomas Wheatley, confirmed that account, adding that Brown does not solicit contributions during the session. GOP Mulls Removal: Fresh off a bruising battle in February for party chair, the Oregon Republican Party is again dealing with internal dissension. Former state Sen. Marylin Shannon (R-Brooks), who has held a long list of party positions, faces removal from her position as Oregon national committeewoman in an April 6 vote of the party's central committee in McMinnville. Documents circulated by members of that committee accuse Shannon of eight offenses, including "lying and character defamation," "character assassination" and "asking the Republican National Committee to interfere in the Oregon GOP primary." The documents say Shannon urged the national party to support Sam Carpenter in last year's gubernatorial primary (he lost to Knute Buehler) and "falsely accused" candidate Greg Wooldridge and former GOP vice chairman Russ Walker of "intentionally splitting the conservative vote" and being "traitors to the pro-life cause." She also allegedly called her colleague, GOP national committeeman Solomon Yue, a "communist spy." Shannon denies she violated party bylaws or referred to Yue as a communist spy. "This whole thing is crazy," Shannon says. "I haven't done anything wrong." Eudaly Wants Lower Barriers for Renters: City Commissioner Chloe Eudaly is finally bringing tenant-related ordinances to the Portland City Council this week to more carefully restrict security deposits as well as limit landlords' screening of tenants' backgrounds. Eudaly wants to reduce barriers to housing, particularly for renters with criminal convictions. The Portland Housing Bureau says the changes would cost $979,500 next fiscal year. Eudaly's office says she's working with the Revenue Division to identify funding sources for a wide range of tenant protections. Mayor Hires Ex-Cop: Mayor Ted Wheeler hired a former Portland Police Association president April 2 to advise his office on issues of public safety. The new adviser, Robert King, retired in 2018 after 27 years with the Portland Police Bureau. He's more experienced than other recent public safety advisers. In addition to serving as police union president, King was the bureau's spokesman, top training officer and, at the time of his retirement, commander of the North Precinct. King replaces Berk Nelson, who left last month for a private-sector job.